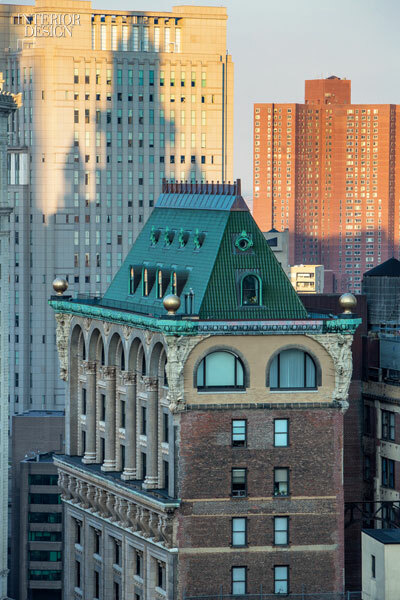 Like an other worldly security detail, 15-foot-tall winged caryatids guard each of the four external corners of a penthouse apartment in lower Manhattan. Their stern expressions recall the Statue of Liberty, whose vigil in New York Harbor began in 1886, nine years before the terra-cotta figures were installed atop what was one of the city’s tallest buildings. Designed by architect R.H. Robertson, the 21-story tower, a stone’s throw from City Hall Park, was among New York’s first steel-framed structures. Given that the proto-skyscraper was built by the American Tract Society, a publisher of religious pamphlets, the imposing caryatids necessarily appear angelic. “It’s an idiosyncratic, ornamental house form: a chateau atop a skyscraper,” says architect David Hotson of the unusual residence perched above the park. “The scale of decoration is just enormous,” he notes, pointing out the mammoth egg-and-dart detail of a copper cornice running just above the arcade—flourishes intended to register at street level. 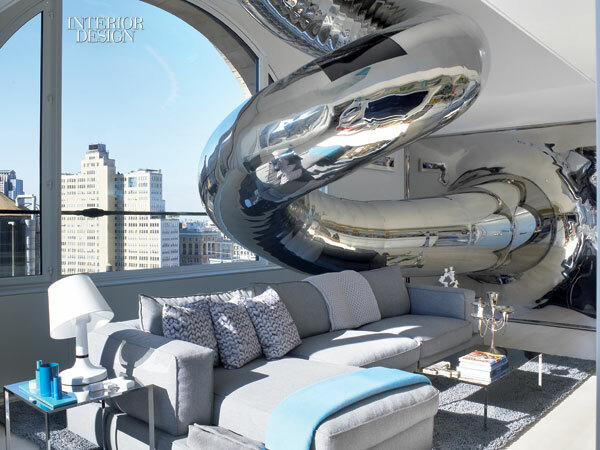 Viewed from the apartment’s 1,500-squarefoot terrace, however, the oversize architectural ornament takes on a surreal, fun-house quality that proves an appropriate prelude to the apartment’s dazzling if occasionally disorienting interior. The building was converted into condominiums in 2002, but the top-floor residence was among the last to sell, in part because it truly was an architectural bauble, lacking plumbing as well as heating and cooling systems. 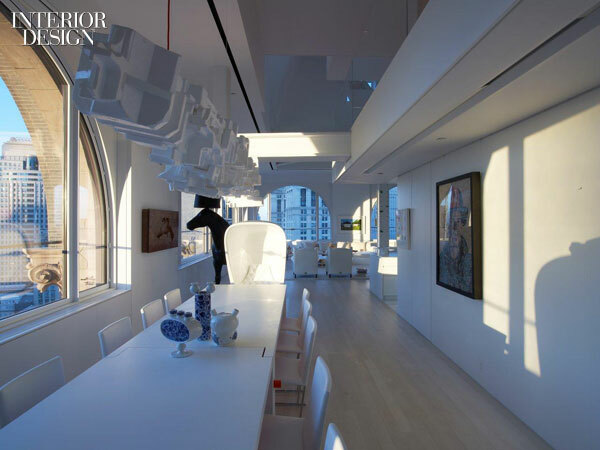 What it did have was the possibility of a 45-foot ceiling and 360-degree city views out massive half-moon windows created by the building’s Romanesque arches. In 2007, the space caught the eye of an intrepid couple. Having previously worked with Ghislaine Viñas on two residential projects, the potential buyers sought her opinion. 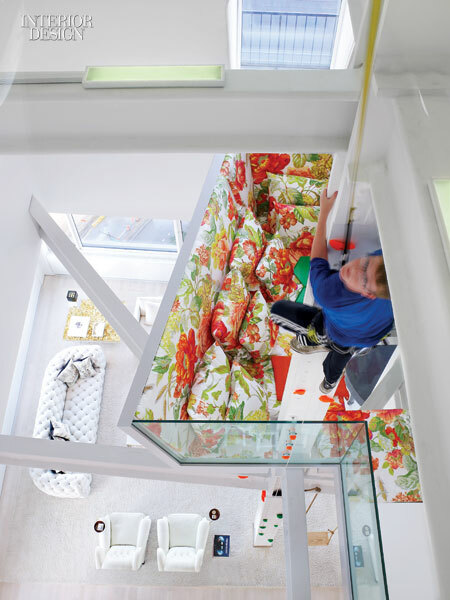 “It takes a special kind of client to tackle this sort of project,” says the interior designer who, knowing they were up for the adventure, advised them to make the leap. Humor, as in an 80-foot-long curving slide? 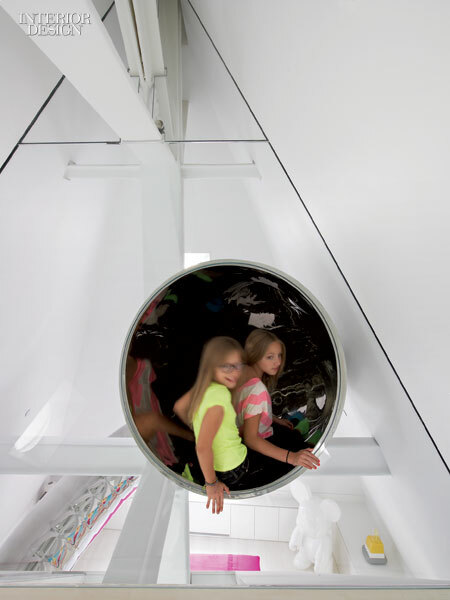 Or perhaps a steel column reimagined as a 45- foot climbing wall? Maybe a guest-bedroom mural showcasing an artist’s interpretation of Michael Jackson’s Neverland Ranch? Taking their cues from the clients, who are serious about play and brought plenty of whimsical ideas to the table—say, a catwalk just for their two felines—Hotson and Viñas conjured a dreamlike topography that demands to be explored. The expansive, quirky landscape offers diverse modes of transport, including a variety of chutes and ladders together with an exquisitely detailed central stair. 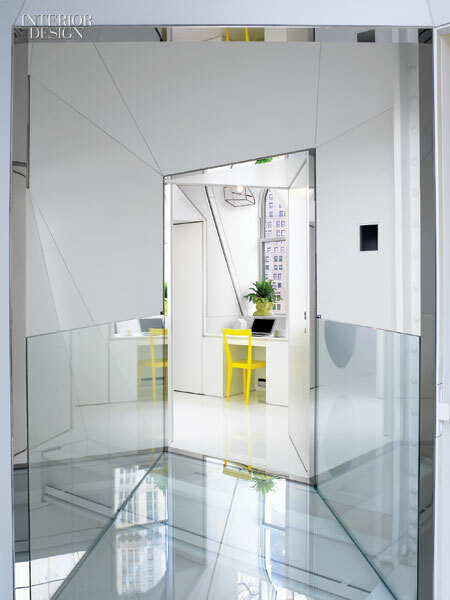 Edged in polished steel, it traverses multiple unexpected design moments, such as a dizzying but delightful glass bridge on the third level. 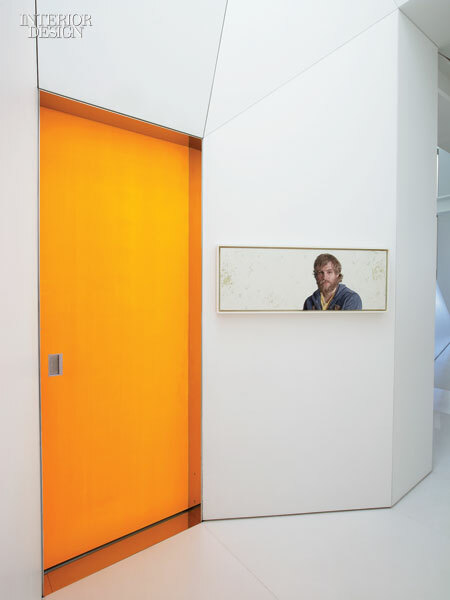 Against the neutral white backdrop, Viñas deployed saturated oranges and greens but in a strategic way. 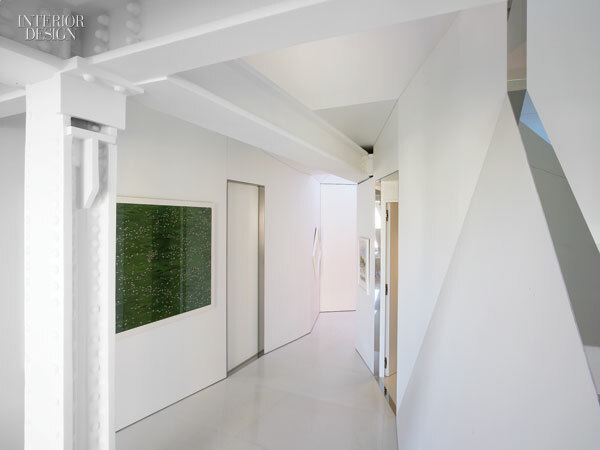 “From high up in the apartment, you see many different spaces simultaneously,” she explains, referring to the fourth floor attic’s bird’s-eye view of the various levels below. 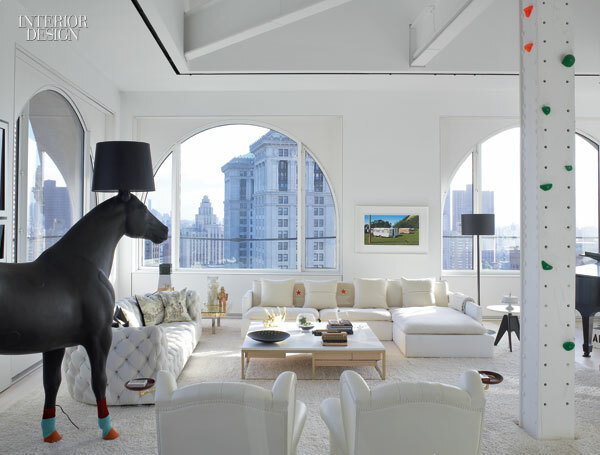 “You have to create a balancing effect.” Looking down from that elevated perch reveals distinct pools of eye-popping color, like the expanse of florid chintz upholstery in the balcony lounge extending over the living area, an all-white affair except for a commanding black floor lamp in the form of a life-size equine statue. While concept runs high in the space, it’s pleasantly mitigated by a sense of casual comfort. The kitchen island lined with bar stools serves as a kind of central hearth, acting as a connector between the open-plan living and dining areas as well as a mezzanine office space, which houses a collection of vintage typewriters and a pair of chairs upholstered in fluorescent orange leather. Pillows covered in a print of oversize cable knit invite a nap on the library’s sectional sofa. A pin-up wall becomes a large-scale version of a refrigerator door gallery in the kitchen hallway, where a simple wooden swing hangs—no doubt the most irresistible seat in house. Along with the apartment’s awesome dimensions— the living area alone could easily accommodate a troupe of trapeze artists—it’s the small-scale surprises that make the space so memorable: A peephole in a shower frames a view of the Chrysler Building; a coffee table by UM Project hides figurines and maps, personal treasures of the owners; the kitchen is anchored by one of the building’s original raw-steel beams, softened with a coat of white matte paint. 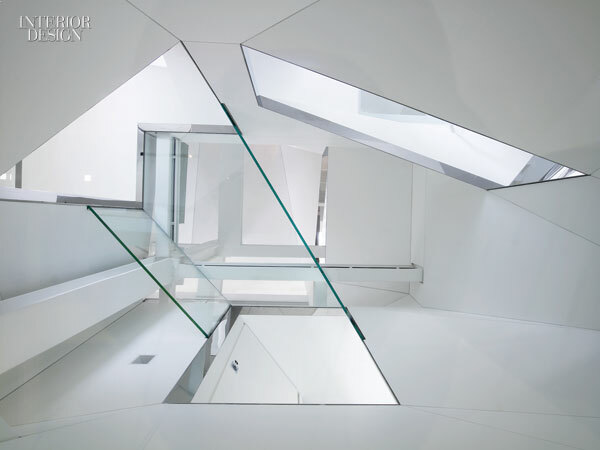 For the skyscraper’s builders, the space was a sculptural showpiece with celestial aspirations. The new owners, who love playing host to family and friends, have created their own high-floor heaven, a strongly personalized home where modernism meets Wallace & Gromit.